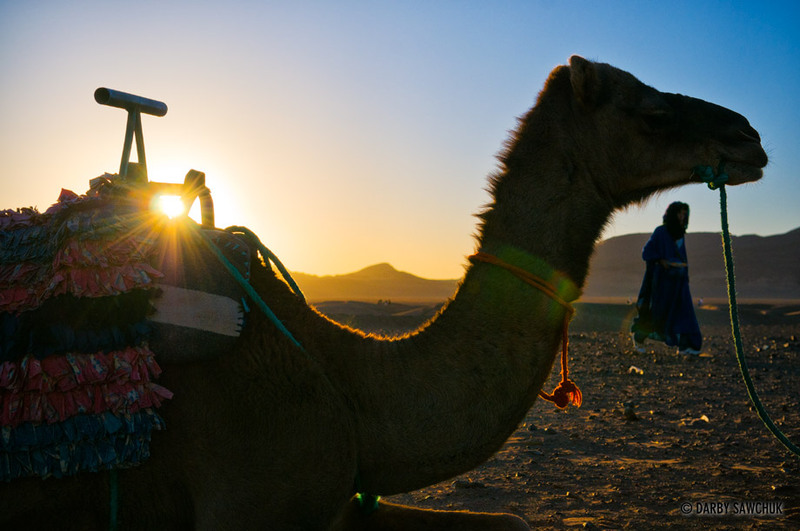 Camel riding isn’t for everyone and I think I might be one of those people. The ships of the desert don’t exactly have the smoothest ride in the world and I wouldn’t have minded a few bumps had my back not been acting up. Besides, I was more interested in pulling out the camera and taking some photos of the belching beasts and I’m sure my four-legged friend was happy to free of this burden. Koubbat as-Sufara is a hall that was once used for the reception of foreign ambassadors, but the creepy crypt below is an even better sight. Through it was only used for food storage, it has the atmosphere of somewhere more likely to be haunted than a simple granary. There were very few visitors present during my time there, so it was relatively easy for me to run around popping off flash bursts to light this lengthy hall. 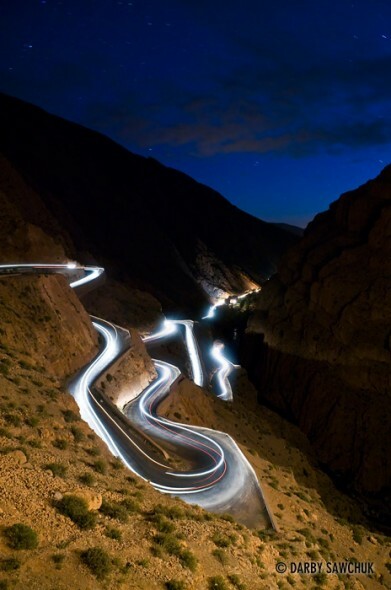 Looking down onto this winding course full of hairpin turns, I can almost see Jeremy Clarkson and friends getting giddy at the prospect of charging some high-powered supercar down through these roads in the Dades Gorge in Morocco. This shot ended up being more difficult to take than it should have been. The battery that powers my little remote-trigger camera attachment failed and without it, I couldn’t do an exposure of longer than 30 seconds without keeping my finger on the shutter. Fortunately, my hand was steady enough for five minutes that everything in the photo was sharp. It was a pleasant surprise considering I don’t consider myself to have the steadiest hand in the business. The evening before I took this photo, I was in this same spot enjoying the calm perspective on the madness of Fez below. It’s a city that seems to be composed almost entirely of alleys and every corner, while magical, is usually inhabited by someone trying to make some tourist dollars. I was happy to have briefly escaped the onslaught of touts, guides, hawkers and salesmen and have a moment of peace. There I was, observing a dun sunset and preparing myself to rise to this same spot for what would probably be a more interesting sunrise than that grey evening when a man approached me and started chatting to me about what a lovely view it was. I agreed and relished the chance to converse with someone who wasn’t aiming to sell me anything. No sooner did I have this thought when he pulled a sack seemingly from thin air and started showing me his wares. I couldn’t believe it. I was one of the only people up here! How could this be a profitable location to set up shop? I politely declined his offers and got back to my camera, constantly hoping for more interesting light to break through and bathe the city. Fortunately he wasn’t too pushy and eventually started back down the hill towards the city. As darkness fell, I was cautioned away from the area by local police who informed me this wasn’t the safest place to be hanging around at night. Thanking them for their concern, I made my own way down the hill only to return early the next morning to catch the sunrise you see below. I do have some shots from the evening which I might post later, but for now, I was partial to this sunrise. The blue-tinted old-town of Chefchaouen actually looks a bit green in this panorama shot at dusk in Morocco. The new town glows orange while the medina is set apart by the green-tinted fluorescent lights obscuring the sky-blue walls of every building. This panorama captures some of the peace ready to be found in one of Morocco’s less hectic cities. An almost 17-foot version of this panorama of Ait Benhaddou will soon be adorning the walls of one of my clients. It will be an absolutely giant print and should make for quite the decorative addition to his walls. The oasis kasbah of Ait Benhaddou, a UNESCO World Heritage Site, and the desert hills beyond made for a striking contrast that was hard to capture in any way other than a panorama. The small river divides the new part of the town that features the hotels and restaurants from the old section that stands frozen in time. The picturesque kasbah has been a filming location for a number of movies for obvious reasons. It’s a location with one foot in the past and that’s now by design – as part of UNESCO giving it world heritage status, the ksar is meant to be free of modern development, so the ten families that live there do so without electricity making the location go almost perfectly dark at night except for a few candlelit windows. 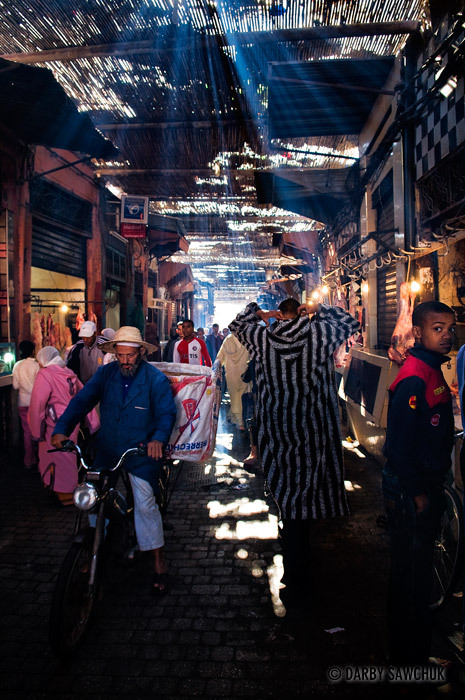 Marrakach Morocco’s Djamaa El Fna is, simply put, wild. At any point in the bustling square at the heart of the city, you might find snake charmers, open-air dentists, food hawkers selling all manner of culinary oddities, carnival games, musicians and dancers, monkey handlers, brightly-costumed water vendors, wizened story tellers, boxers smacking each other, and who knows what else. While it’s an interesting site during the day, it really comes alive in the early evening when the food stalls are set up, the hungry crowds roll in and smoke starts rising off grills and barbecues. It can be a bit of a sensory overload with those smokes wafting intense cooking smells, the musicians competing for audiences’ attention, a glut of interesting sights, and the masses of people pushing up against each other, but the best strategy, as with the nearby souks, is just to get lost in it all. And after you’ve done that, sometimes it’s good to retire someplace a little out of the way to see the bigger picture. Rooftop bars surround the square and provide a bird’s eye view of the semi-controlled chaos below. Buy yourself a beverage and take it all in. That’s what I did and shot this panorama while I sipped a cool drink. 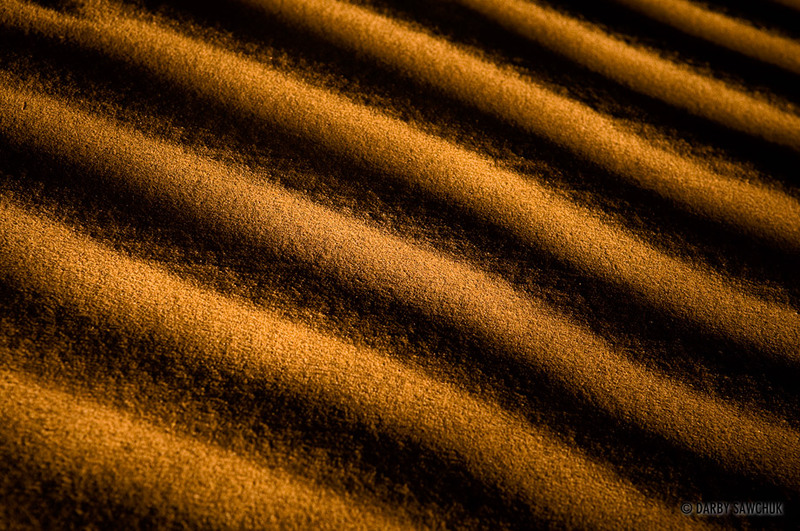 The dunes within the dunes of Zagora are here lit with a flashlight in the dead of night. The fascinating textures ripple across the larger dunes to form miniature landscapes. Light beams filter through slats to illuminate the smoky air of the Marrakech Souks where you can buy everything under the Moroccan sun. The smoke from grills cooking succulent meats mingle with the exhausts of motorbikes speeding through alleys far too narrow for vehicular traffic to create a hazy aura in the market. If the city of Fez originated in a design, it was designed to confuse. Each road shoots off into another narrower alley that branches into ever more constricting passages to eventually lead a new visitor into a state of bewilderment. Couple that with the general pummeling your senses take at the hands of the masses of people and their wares and the city takes on the character of a dream. In a city like this, open spaces are a rarity. For kids that want to have a game of soccer, there aren’t a lot of wide areas where a game can take place. 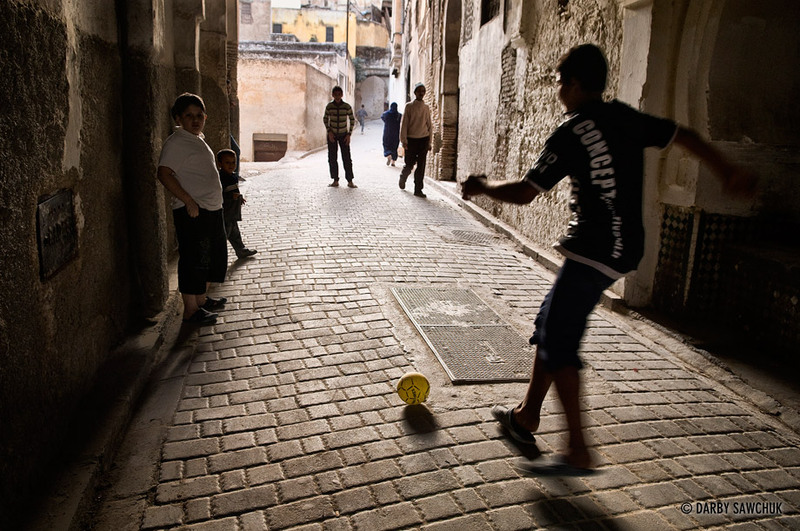 So, they make do and you get a scene like today’s photo where kids kick around a ball in while being closely hemmed in by the walls of one of the medina’s wider avenues. 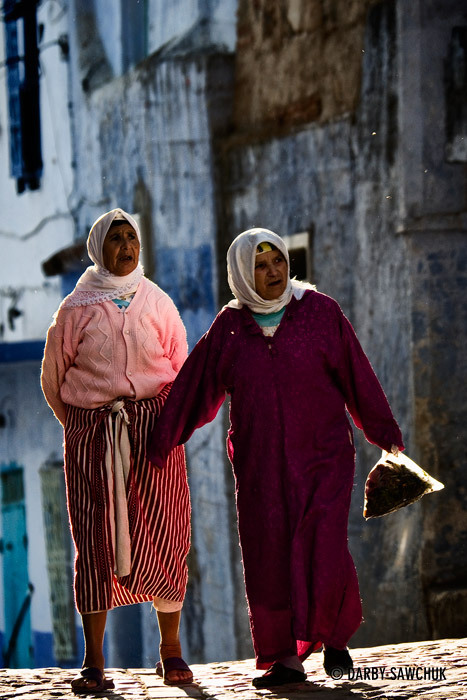 As with this recent shot, today’s photo of the day comes from Chefchaouen, Morocco. Chasing the light through the narrow, blue alleys was good fun and sometimes resulted in nice backlit shots like this that give a nice rim light to the people. I love both the weathered walls and weathered, character filled faces. This shot is from an enormous crypt located below the Koubbat as-Sufara in Meknes. 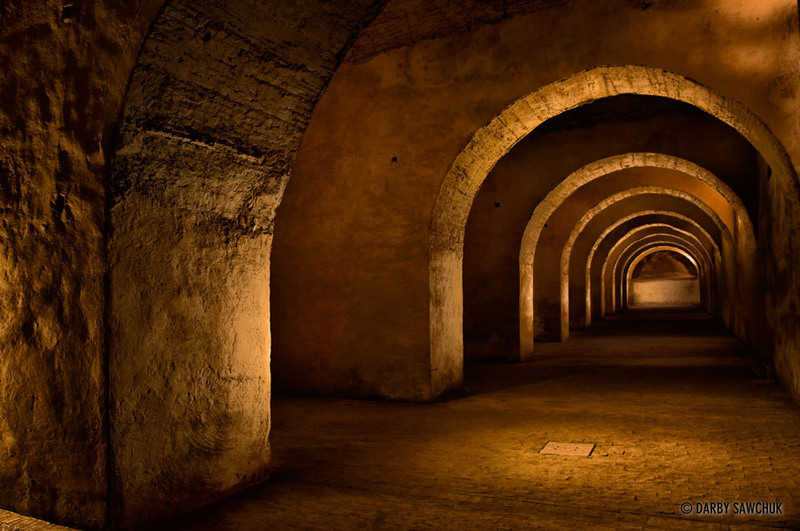 Though it might look like a dungeon, it was actually used for grain storage. This is another of the images lit with multiple speedlite bursts in multiple shots. Using the lights in this way ended up giving a lot more depth and texture to the shot than I might have gotten otherwise. 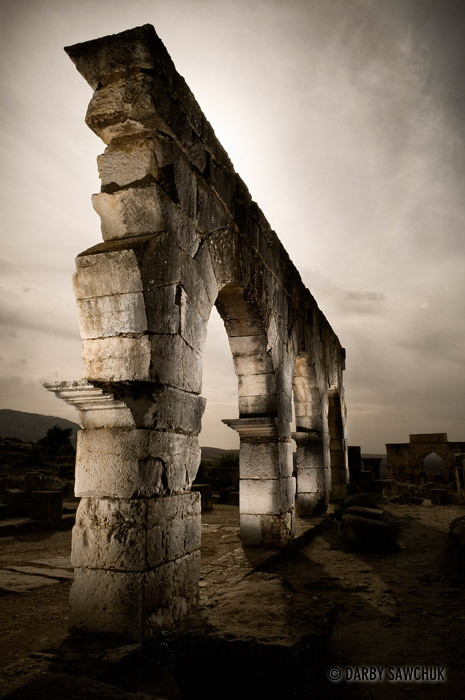 This is the last of my little experiments at Volubilis of lighting the ruins with a number of bursts from a speedlite. This one was taken during an overcast day which allowed me to stop down and overpower the ambient light with my flash. Again, a moody, atmospheric image is the result. I took a number of other images at the ruins, but no more of this type. I do, however, have another of these multiple-flash composite shots for tomorrow from another location. 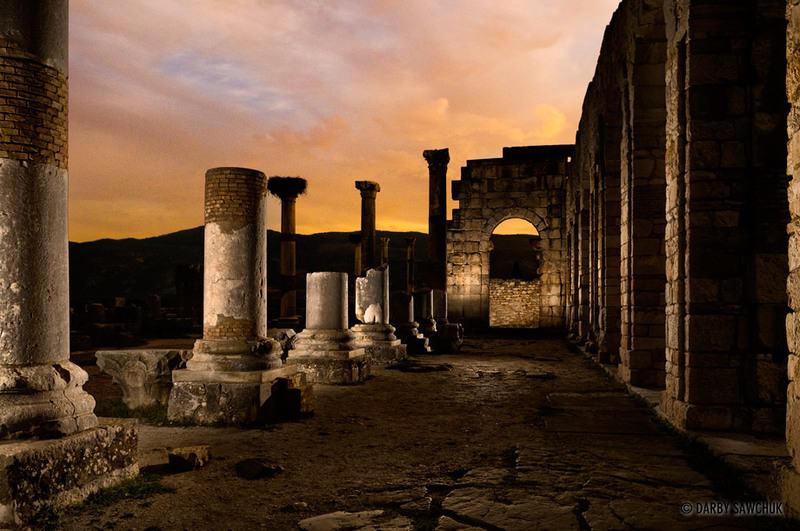 As with yesterday’s photo of the day, today’s was taken at the Roman ruins Volubilis, Morocco using the technique of lighting various areas with a speedlite and then compositing them together in Photoshop. This one turned out even more surreal than the last. It’s difficult to visualize what whole will look like when you can only see a part at a time, so half the fun of creating a shot like this is seeing it come together. 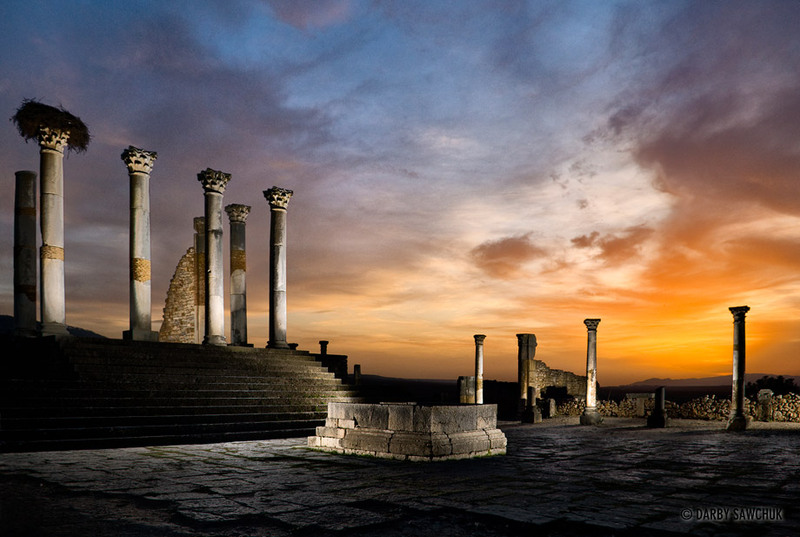 It would have been easy to let a magical sunset do all the lighting work at the Roman ruins of Volubilis in Morocco. The light was as perfect as could ask for, but I felt like I wanted to do something a bit more. So, in addition to the light of the sunset, I decided to light the ruins myself. I ran around with a speedlite popping of flashes and after assembling about 20 or 30 shots in Photoshop, we have a slightly surreal view of the place that couldn’t have been seen otherwise. I’m actually quite pleased with this little light-painting experiment. The scene takes on a dramatic, strange feel that wouldn’t have been there had I not run around like a crazy person in the few minutes that the light was perfect. 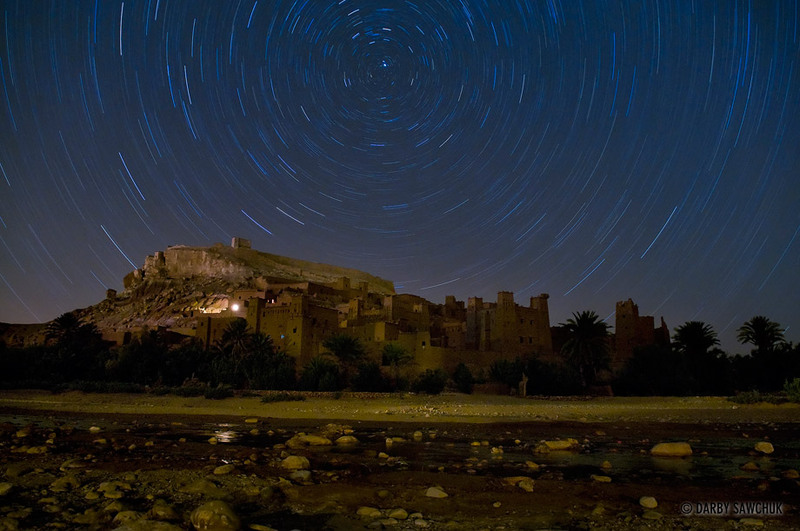 Perfectly-preserved Ait Benhaddou and its lack of electricity made an ideal location to try out a half-hour exposure to capture some star trails. The Moroccan village keeps its UNESCO world heritage status by maintaining a way of life similar to what was present hundreds of years ago when the group of forts was built. That means no electricity lights up the buildings at night. There are a couple of lights visible in this image, but one is either a lamp or a candle and I think one is a flashlight. At a half hour exposure, they look like someone snuck a generator inside the complex. This shot points directly North, so the stars appear to revolve around Polaris to create a nice swirling effect in the sky. It took me a little while to warm up to Meknes. It wasn’t immediately apparent to me what it had going for it that might be different from the other cities I had already visited. 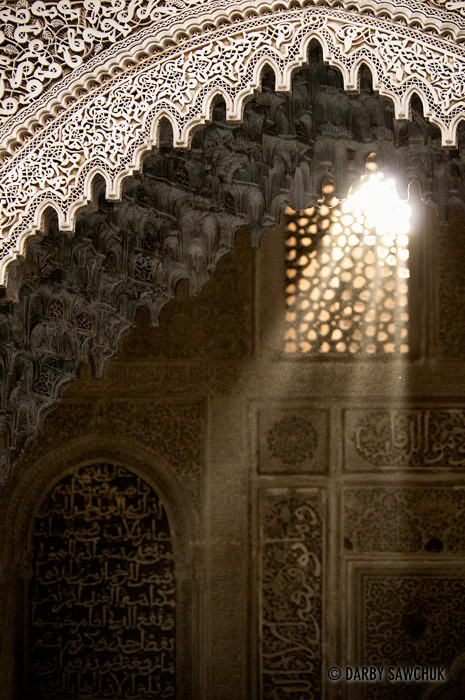 Eventually, it revealed its charms and one of those was the Medersa Bou Inania where intricate stone carvings hosted a gorgeous dance of sunbeams one fine morning. After a couple weeks of travel, Morocco’s many medinas start to blend together. The claustrophobia-inducing alleys are never dull, but who doesn’t like a bit of variety? A trip to Chefchaouen provides just such a change. The obvious difference between the old town of hilly Chefchaouen and its larger cousins is the sky-blue paint that covers nearly every wall of the city. This ubiquitous hue gives the city a special visual character, but another crucial difference is the greater sense of calm that tends to reign in these hills. Less hassling happens here and when it does occur, it’s less intense than in the more populous centres. 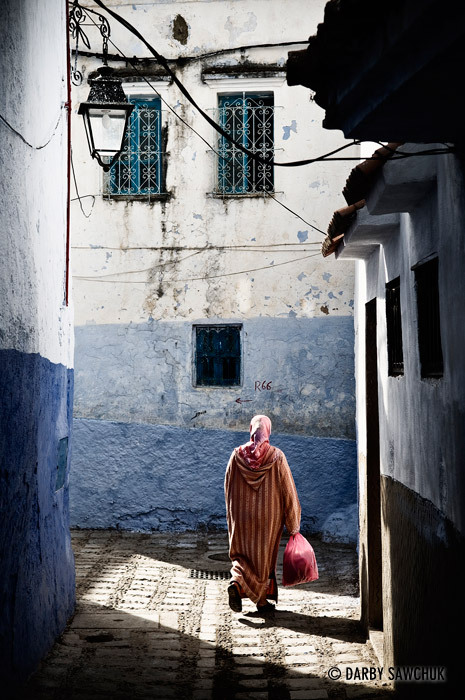 The old cities in Morocco are always a treat for a photographer who’s willing to look and wait for the light. As in this photo, sunbeams sometimes pierce the defenses of the buildings and illuminate the narrow roads creating dramatic scenes of light and shade. Considering just how popular it is, the tanneries can be difficult to find without help if you’ve just arrived in town. Fez truly is a maze, but if you have a couple days and a reasonably good sense of direction, you’ll be able to fumble your way to most locations without aid. Amid the labyrinthine alleys of the city, a few clues will let you know you’re getting close to the tanneries. First, you’ve probably been heading downhill for a while (the tanneries are near the river), the smell (pigeon feces and cow urine are major components in the chemical stew used to treat the hides), and lastly, the people who will offer to scam you of your every last dirham guide you to this major tourist spot. The tanneries will overwhelm you. The legendary smell will knock you off your feet, but shop owners and guides will provide you with a fresh sprig of mint as an antidote to the odour. The sights, sounds and feel of the place are just as piquant. Multicoloured vats of chemicals and dyes host rough-and-ready workers sacrificing some of their lifespan for a the job of sloshing around in noxious potions to treat the skins that will eventually turn into leather. 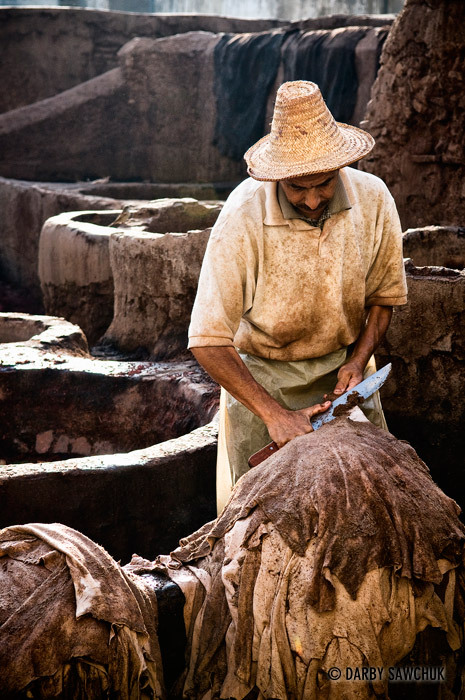 Most tourists and travellers experience the tanneries from above. Guides will lead you into leather shops overflowing with handbags and poufs, up some stairs and onto a balcony that overlooks the vats. After getting their fill of the vista, visitors are then expected to either tip their guide or purchase something from the shops (and given the Moroccan penchant for the hard sell, consider yourself to have done well if you escape without an unwanted handbag). This particular photo, however, was clearly not taken from above. If you know exactly which alley to enter, you can make your way quite close to the entrance of the tanneries. You’ll soon be confronted by a manager who may or may not be willing to guide you through the site. If you’re going to give it a try, I would recommend only keeping as much as you’re willing to pay in your wallet and no more. When you’ve already paid your agreed price, they’ll keep trying to extract more cash from you, but if you have no more to give, the haggling ends quickly. Just show them your empty wallet! I’ve been sitting on my photos from Morocco for a while now, but I had a good reason. I was in a group slideshow exhibition last week and I wanted to unveil the images there, but now that it’s over, I’m free to show them off a bit. This particular picture is a sunrise scene shot in the dunes near Zagora. I took an overnight trip to the edge of the dunes where you can get a taste of the Moroccan desert if you’re short on time. Earlier that week, I had visited the impressive dunes of Erg Chebbi that happen to reside at the paper edge of the Sahara, so this sandy trek near Zagora wasn’t quite as impressive as it could have been had I not previously visited larger dunes. 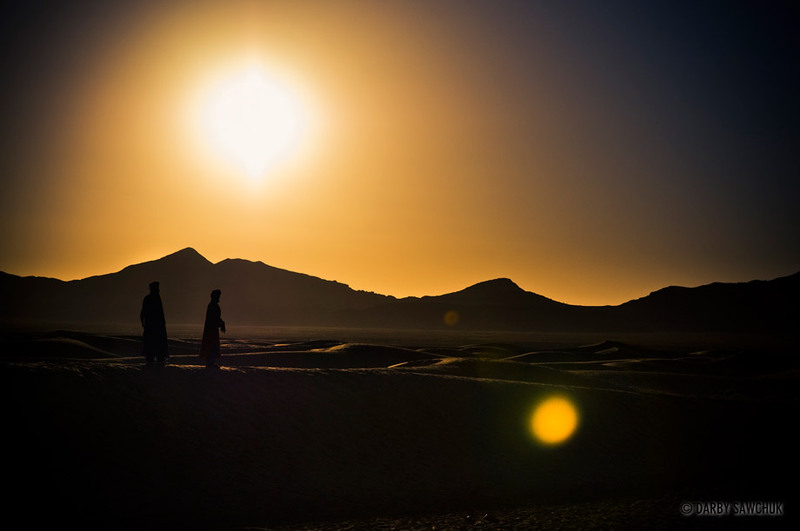 Nevertheless, it made for some fun scenes to capture like this shot of the sun rising over the mountains while our guides searched for stray tourists who had wandered into the dunes in the hopes of having a slightly more authentic desert experience. Three weeks and a whole lot of memory cards later, I’m back from my trip to Morocco, and I’ve enjoyed the laziest of Sundays. Being a photographer in Morocco is sometimes like being a kid in a candy store except that you have no spare change. You’re surrounded by people with incredible faces full of character and interest, but the majority of them are so resistant to having their picture taken, you miss a lot of opportunities for wonderful portraits. But of course, Morocco has more to offer than just portraits. Landscapes and cityscapes, deserts and mountains, wildlife and life in general. Hopefully I was able to capture some of it and I’ll be able to start sharing photos sooner than later. It may, however, be a busy week with getting back into the swing of things here in Manchester, so for right now, there’s a couple more Photo of the Day posts from Prague yet to come. 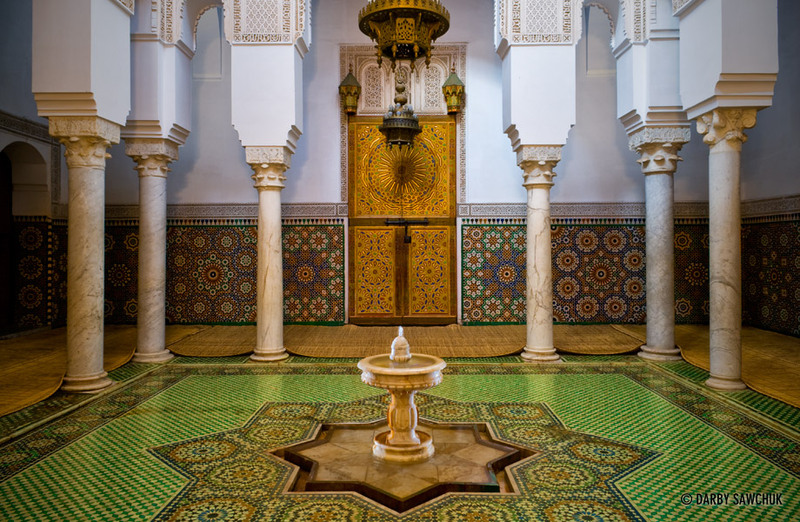 After that (possibly next week) I’d like to be able to start cranking out some fully-processed shots from Morocco.